Chelsea fans during the match between Chelsea and Malaysia at Shah Alam Stadium Sunday. After a one-sided match that saw his new charges see off the Malayan Tigers 4-1, Chelsea Manager Jose Mourinho responded to the question as to why Chelsea keep making Malaysia one of its pre-season stops. "Well, the stadium is blue." 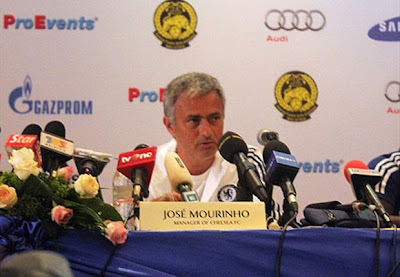 He clarified that Chelsea were not here for the money and marketing, instead they were here for the passion displayed by the Malaysian fans of Chelsea. This visit is the fourth time the London side have been in Malaysia in the past ten years. Although the Malayan Tigers did not don their usual away blue kit, their performance was enough to leave their Head Coach K. Rajagobal feeling blue. "We all watched the match and we tried to press [Chelsea] early in the game. "But the lack of concentration gave them an early lead. 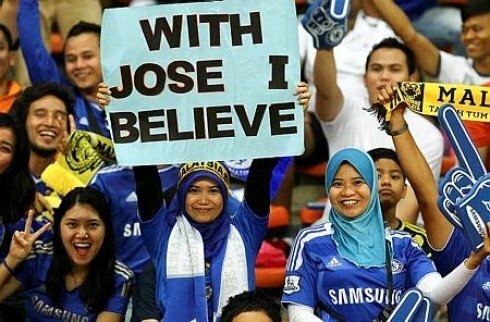 Jose Mourinho has an affinity for the Malaysian fans. "And while his players were in the midst of regrouping after the first goal, they were hit with the second, again through a lapse in concentration," Rajagopal conceded. He also expressed his disappointment at the performance of midfielders K. Gurusamy and Shakir Shaari, whom he felt were not playing as well as they should. However, he spoke glowingly of the rest of the squad, particularly those he brought on in the second half. "Amirizwan Taj came on and played well. "I was quite impressed with Nazmi (Faiz) as well. "For a small player, he did very well," King Raja said. He then commended his captain Safiq Rahim for performing well despite coming back from an injury. Malaysia: Farizal Marlias Azizi Matt Rose, Asraruddin Putra Omar, Mohd Aidil Zafuan Radzak, Nik Mohd Shahrul Azim Abd Halim, Shakir Shaari, K. Gurusamy, S. Kunalan, Mahalli Jasuli, Amri Yahyah, Norshahrul Idlan Talaha. Chelsea: Mark Shwarzer, Branislav Ivanovic, John Terry, Michael Essien, Kevin De Bruyne, Wulfert Cornelis Van Ginkel, Eden Hazard, Romelu Lukaku, Nathaniel Chalobah, Ryan Dominic Bertrand, Bertrand Traore.